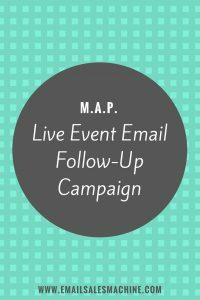 Looking for a unique way to get more email addresses from live events like trade shows? No matter how crazy these ideas may sound, believe me they work and the more effort you put into it the better results you’ll see. Most people who go to a live event like a trade show put a ton of effort and money into creating a cool looking booth, but just because you build it doesn’t mean they’ll come. If you take some of that booth money and put it towards theming out your team there’s a real good chance your booth will become the talk of the whole trade show. Includes entire plan, email framework templates, and list of tools and resources you need to succeed quickly. Let me explain, imagine you sell some sort of software product that does email marketing. What would happen if your entire team were required to wear some sort of ninja or samurai costume? Trade shows are all about buzz, so why not be THE Buzz that everyone is talking about? Let’s say your average customer is worth $10,000 over the next year. Couldn’t you afford to give away a $1,000+ prize to get more people on your email list? All you would need to get is one customer from the trade show and you come out ahead by $9,000 giving away the $1,ooo prize. If you get a few more customers than you’ve got a profitable trade show. Sticking with the ninja theme you can use your team or hire a model or two to walk around the trade show telling everyone to go visit your booth for the free prize give away. You can give them paper ninja stars and tell them that if they get the star signed at the booth they’ll get a free drink, food, or etc. (more on that in step 3). This approach works great because many people will approach your ninja’s and ask if they can take pictures with them. Conversations naturally occur while people take photos. So seize the opportunity. After taking the picture your ninjas should invite people to visit your booth to sign up for the $1,000 prize give away and hand them the paper ninja star. People’s curiosity will get the better of them, and because you took the time to take a picture with them they’ll feel compelled to visit your booth. Now that your team and ninjas are sending people to your booth you need to keep them there. The longer you can keep the prospects there the better chance you can make a connection and build long lasting business relationships. Free games…carnival games, video games, or etc. You’ll notice that people tend to be grateful for the free massages, food, games, drinks, or etc. and will linger. They’ll want to find out more about your company and conversations will begin to flow. There’s a good way to capture data (typically a name and email) and then there’s “the best” way to capture data. Note: When you capture their data it gives you the chance to follow up with them via an email drip campaign. You ﻿can download a free trade show email follow-up campaign here. I’m just going to give you the best way to capture data. Make sure you’ve got some sort of lead capture software or paper forms to input prospects information. When capturing data make sure your paper forms, mobile devices, or whatever medium you’re using to get their data for the prize give away is easily accessible. Paper forms should be on clipboards with attached pens so prospects can easily write in their contact information. Using clipboards, iPads and digital tablets makes it easy for prospects and your team members to easily ask people to fill out the forms without relying on a table or other hard surface that’s not as mobile. When creating your lead capture forms make sure you don’t leave any open ended questions because people will either lie or they might not know the answer. However, if you jog their memory or do the majority of the thinking for them they’ll give you more info. How to collect more info from your prospects. The standard name and email is a given, but make sure you get more data so you know who your best potential buyers are. For example, if you ask, “What’s your yearly revenue?” and leave the answer as a blank line most people will either leave it blank, lie about their revenue, or maybe give you the truth. Take the guess work out of it. Give them multiple choice answers. Your prospects will just check the box that fits with their business. 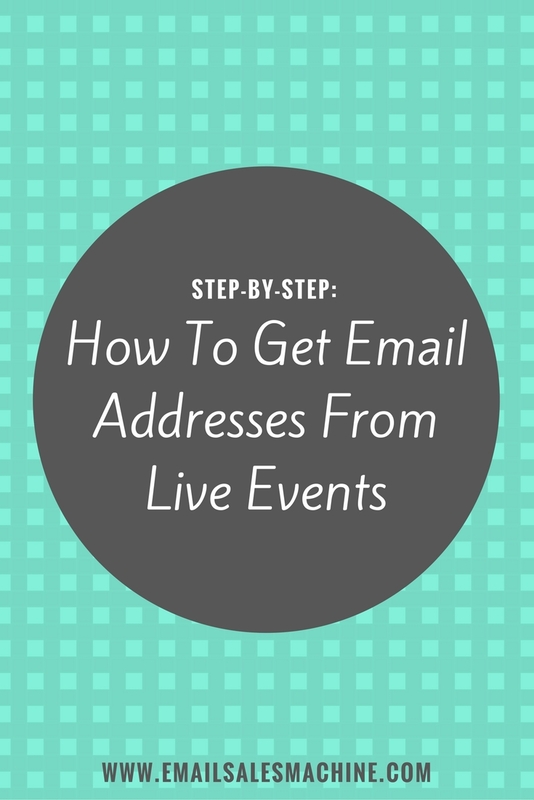 If you follow these steps on how to get email addresses from live events and plan ahead you’ll get more leads then ever before. Are you setting up a booth at a trade show soon or know someone who is? You just might make their day and help them make some money or grow their list. Doing good…is good…so do it anyways.